People often ask what the experience of laser tattoo removal treatment will be like. How long does treatment last? Does it hurt? Is there any preparation needed? Is there a lot of special care required following treatment? The time that it takes to perform laser tattoo removal treatment is related to the size of the tattoo. Obviously, larger tattoos will take longer to treat. However, treatment, in general, can be performed quickly. In our office, a typical treatment will last approximately ten minutes. A very large tattoo might take a bit longer. Very small tattoos can often be treated in as little as one minutes or even less. People most frequently describe the sensation of having laser tattoo removal treatment to be similar to being snapped with a rubber band. 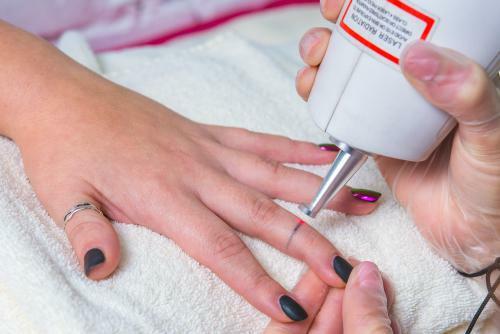 People also frequently say that the discomfort is no worse than getting the tattoo in the first place, but the treatment takes much less time. In our office, we typically cool the area prior to, and during treatment. We also apply a topical numbing cream to the area in preparation for treatment. If people are extremely sensitive to the discomfort, the area can be treated with injectable numbing medication called lidocaine. However, this is rarely necessary. Prior to undergoing laser tattoo removal, you should not tan the area that is going to be treated. The area should be kept clean. No makeup or cover-up should be applied to the area immediately prior to treatment. Following treatment, the doctor or one of our nurses, will carefully dress the wound and will show you how to take care of it at home. The process is very simple. You will apply a nonstick ointment and dressing to the wound during the time that it is healing. You might notice some scabs form on the treated area during the healing phase. It is also not uncommon to have some blisters develop temporarily, especially with tattoos that have colored ink in them. You will keep it covered during this healing process. In most cases, this will last for less than a week. You will be instructed to avoid tanning the area during the healing process. Usually, within about a week, the appearance of the skin will return to normal. Then, over the next 6 -10 weeks, you will see that the ink is beginning to fade. We can take photographs prior to each treatment so that you can clearly compare before and after photos and follow your progress. If at any time between your treatment you have a question or a concern, we are happy to see you back in the office as needed to examine the area and address your concerns. There is never a charge for these visits. If you are experiencing tattoo regret and are considering laser tattoo removal treatment, Shore Vascular & Vein Center in Somers Point, New Jersey is the only center in the region to offer the latest Enlighten picosecond laser for the fastest, most complete tattoo removal available for most tattoos. We proudly serve all of southern New Jersey, including Atlantic County, Cape May County, Camden County, Cumberland County, and Ocean County. Call our Board Certified Surgeon, Dr. Jeffrey Gosin, (609) 927-3030, for a FREE consultation or visit us on the web at EndTattooRegret.com.